When I bought this clock at auction it had a very rough and very warped seatboard. I replaced the seatboard with a piece that reflects the originals shape. Note that the mechanism is held to the seatboard by two screws through the lower mechanism posts - you can just see a bit of the screw from this side, and the top of the hole in the post. 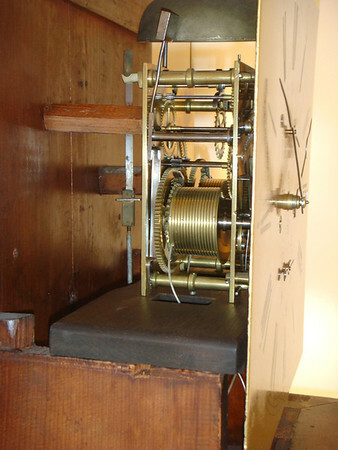 Again, a very unusual arangement for a British Tall-case clock, reflecting both the individuality of the maker and the distance from Londons stifling influence.